In all images, north is at the top, and east is at the left. 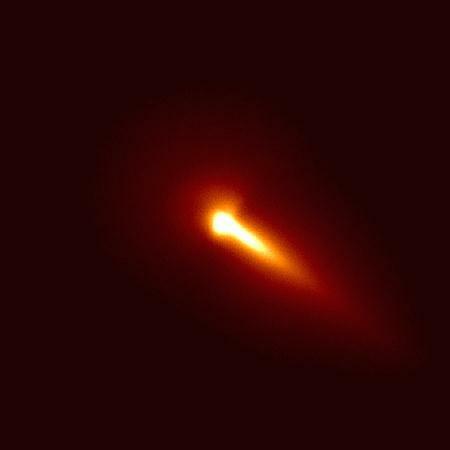 Comet Hyakutake (1996 B2) imaged at the University of Hawaii 2.2 meter telescope on UT 1996 March 23. This is a 1 second integration taken through an R filter. Longer integrations saturated the detector. In this first image, the image is shown with only minimal processing. Nevertheless, the tailward spike is evident, as are asymmetries in the coma surrounding the nucleus. The original image scale was 0.22 arcseconds / pixel. A sub-frame of the 2048 x 2048 charge-coupled device is shown, with field of view 220 by 220 arcseconds. At this time, 1 arcsecond = 87 km, measured at the comet (geocentric distance = 0.12 AU). The second image shows the same CCD data as the first, but now more heavily processed to enhance coma structures. In addition to the tailward spike, several jets are apparent. The arcuate intensity minimum in the upper left (north-east) coma appears to be real, and may separate two discrete jets that overlap in the plane of the sky. The color coding is from darkest = black through blue, red and yellow to brightest = white. 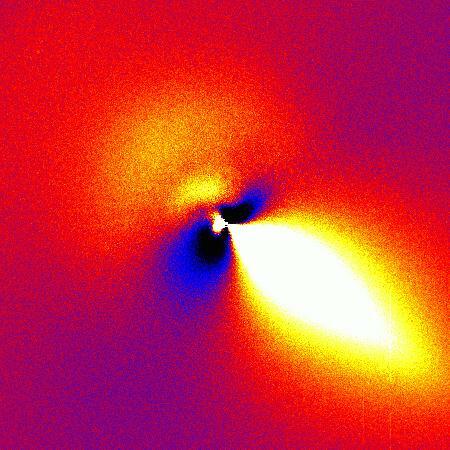 The existence of jets in this comet suggests that outgassing is confined to active areas on the nucleus, rather than global in nature. Thus, the jets indicate that, like the nuclei of previously studied short-period comets, the nucleus of Hyakutake (B2) is mantled by involatile material, with only a few active patches of exposed ice. Presumably, this mantle is composed of debris too large to be ejected from the nucleus by the drag of sublimated gases (a "rubble mantle"). Simultaneous observations from the JCMT have recorded thermal emission from escaping millimeter-sized particles in the near-nucleus coma.